In December 2017 the Committee on Standards in Public Life published a report - "Intimidation in Public Life" (Cm 9543). The report was debated in the House of Commons on 18th December where the Home Secretary (Amber Rudd MP) said - "The report demonstrates that a significant proportion of candidates in the 2017 general election experienced harassment, abuse and intimidation, and that the widespread use of social media platforms is the most significant factor driving the behaviour that we are seeing. Worryingly, this is already affecting the ways in which MPs are relating to their constituents, and has put off candidates who would otherwise want to stand for public office." 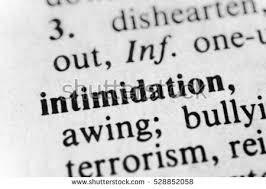 The report points to "the increasing prevalence of intimidation of Parliamentary candidates, and others in public life." "A significant proportion of candidates at the 2017 general election experienced harassment, abuse and intimidation. There has been persistent, vile and shocking abuse, threatened violence including sexual violence, and damage to property." The committee is concerned that "intimidatory behaviour is already affecting the way in which MPs are relating to their constituents." It has "put off candidates who want to serve their communities for standing for public offices, and threatens to damage the vibrancy and diversity of our public life." The committee's terms of reference included establishing whether measures in place to address intimidatory behaviour, including the criminal law, are effective and enforceable. The report asks the government to consult on the introduction of a new offence in electoral law of intimidating Parliamentary candidates and party campaigners. the existing criminal law in respect of intimidatory behaviour. No behaviour which is currently legal should be made illegal. However, we believe that the introduction of a distinct electoral offence will serve to highlight the seriousness of the threat of intimidation of Parliamentary candidates to the integrity of public life and of the electoral process, and will result in more appropriate sanctions. specifically targeting Parliamentary candidates and their supporters. 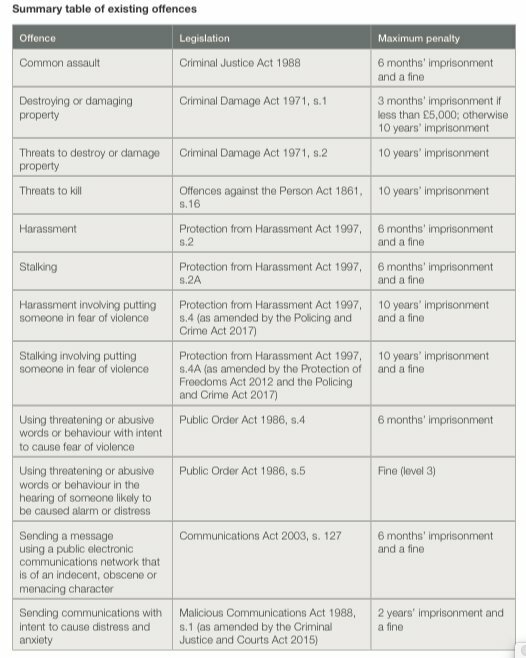 English Law already has a considerable range of offences which are capable of being used to deal with intimidatory behaviour. 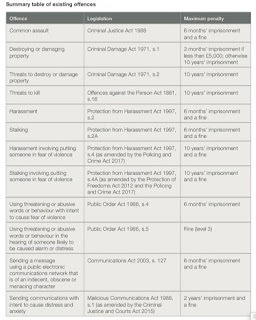 The report contains a table at page 68 setting out a list of existing offences ranging from common assault to offences against the Public Order Act 1986, "stalking" (Protection from Harassment Act 1997), offences under the Communications Act 2003 s.127 and the Malicious Communications Act 1988.
sanctions can also involve sanctions under electoral law. These sanctions are specific to the election process, such as being barred from voting for a certain period, or removal from the electoral register. Such sanctions recognise that these offences, such as undue influence or electoral fraud, are offences against the integrity of the electoral process, and that it is therefore appropriate that individuals face sanctions relating to their own privileges within that process. In February 2016, the Law Commission published an interim report on Electoral Law. Recommendations 11-1 to 11-9 concern Electoral Offences and, in particular, Recommendation 11-4 stated that "Undue Influence" should be restated as offences of intimidation, deception and improper pressure. Democracy requires that political candidates subject their views to the general public and robust challenges are to be expected. Some challengers will be outspoken: others will be ill-informed. Those are the ingredients of political debate but, as the report amply shows, there have been times when conduct has become criminal. The report recommends a consultation on the introduction of a new offence in electoral law of intimidating. 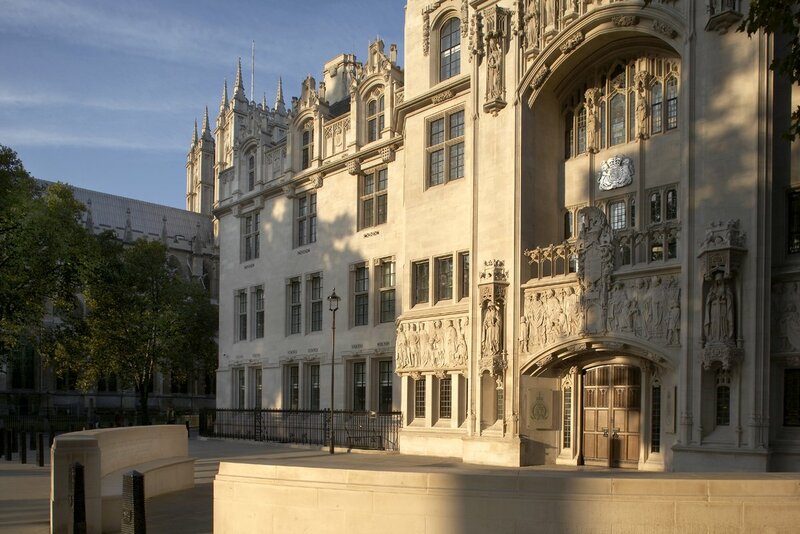 Given the range of existing offences, one wonders whether another offence is strictly necessary though a new offence might permit the additional sanctions referred to earlier. Further details of any government proposal is awaited and in a speech delivered in Manchester on 6th February the Prime Minister indicated that the recommendations of the report are to be implemented. In December, Amber Rudd said that the government would consider the recommendations in detail, and respond to them in due course.